SKU: 8257. 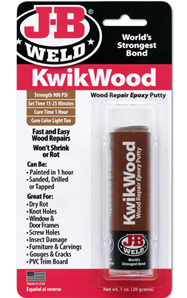 Categories: Epoxy Putty Sticks, Wood, Wood Restore Products. * For best results use a detergent or degreaser to first clean the surface, then roughen surface with file or coarse sandpaper to provide the best repair. STAINING: KwikWood accepts stain differently from wood. Some types of pigments and colorants may be added during the mixing step. Always test for stain acceptance, color match and hardening before application.